Who's shoe-less foot should optionally get tickled during the first hour of "Initiation Class?" The ongoing VIP-Lounge poll about who’s shoe will get stolen during the first hour of day one in “Initiation Class” has so far brought up 3 serious candidates for additionally getting tickled: Sylvia, Christa and surprisingly Lamya. 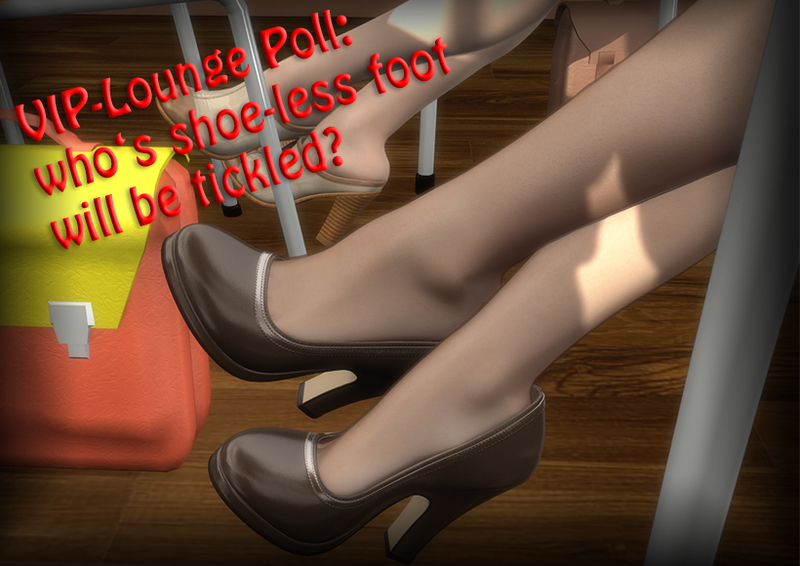 I wanted to exclude Miss Fisher from this tickling poll, because she is as a teacher and I would not recommend tickling a teacher as early in the story, but with atm 3 votes in the shoe-stealing poll Miss Fisher has earned her right to participate. Gizem is still very likely to lose a shoe due to the public poll, but VIP’s decided to spare her perfect and extremely sensitive foot for the time being. Of the 3 girls and 1 woman participating, Christa would hate getting tickled and try everything to avoid it, Lamya would probably pretend she isn’t ticklish to provoke an even more humiliating public tickling and rookie teacher Miss Fisher would be thunderstruck, not knowing how to react. Thomas was voted into this poll too, so we got our first guy who might get tickled. He’s of the submissive Kind, would hate to get humiliated by tickling but would very likely not put up any resistance. Maybe in the end all of them will get tickled at some point during day one. This poll will just help me to decide which scene should be available first. The tickling will be optional when not essential for the story. So VIP’s interested only in shoe-loss must not worry and Need not to participate in this poll. A second vote for Miss Fisher and None for the others! You do want to spoil her first day completely, don’t you? How could she ever maintain discipline in class after that? Have mercy with a nice, socially competent and kind hearted Rookie teacher! I that nobody steals Thomas’s sock as well as his shoe. I was rooting for him to get Gizem’s high heel but it looks like it could backfire for him. Would Gizem really be cruel enough to punish him for trying to steal her shoe by keeping his shoe and sock?